What is an Interval ? An interval is the distance between two notes, each one is represented by a number (1,2,3,4,5,6,7...) and a prefix related to its quality ("M" for major, m for minor, "P" for perfect, "d" for diminished and "A" for augmented). There are five different qualities. An interval can be melodic, when the tones are successive (played one after the other) and harmonic, if the notes are stacked (played simultaneously). 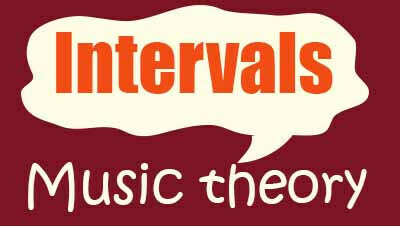 Knowing the name of each interval is very important for any musician, they are essential elements of music theory. Intervals are very useful to understand how chords and scales are built. This article shows you how to make the difference between them. This chart shows the names of the most used intervals while at the same time demonstrating the relation between a simple interval and its related compound interval. You must know that a simple interval is less than an octave and a compound interval is larger than an octave. The major prefix is only used for seconds (2), thirds (3), sixth (6) and seventh (7). Major intervals are usually labeled with a "M". The minor prefix is also used for seconds (2), thirds (3), sixth (6) and seventh (7). In this case, minor intervals are labeled with a small "m". Perfect intervals are labeled with a "P". They include the fourth (4th) and the fifth (5th). They are so-called because of their perfect consonance. The augmented quality is especially applied to perfect intervals (fourth and fifth) and sometimes to seconds and thirds. It means that they are augmented with a semitone. Augmented intervals are labelled with an "A" or sometimes with "Aug" or "+". Diminished intervals are created when a fourth is lowered by a half-step (semitone) although more rarely 2nd, 3rd, 4th, 6th and 7th are concerned. They are labeled with a small "d" and abbreviated "dim" and even written with a "o". This overview chart provide a reference point to determine the different possible qualities. What's an inverted interval ? A simple interval can be inverted by raising the lower tone an octave or lowering the lower tone an octave. In other words, this is an interval whose lower tone is switched with the highest. For example, when a minor second interval (C and D) is inverted it becomes a major seventh interval (D and C). Here is a list of the intervals and their inversions. What Are Complementary Intervals ? Two intervals are complementary when the addition of these two intervals give an octave. This is the addition of an interval and its inversion. Check out the chart above, you can see that m2 (1semitone) and its inversion M7 (11 semitones) are complementary. 1 + 11 = 12 semitones needed to get an octave. What Are Enharmonic Intervals ? Enharmonic intervals have the same sound, but are named differently. The most known are the augmented fourth and the diminished fifth. These intervals divide the octave into two equal parts. That's what we call "the tritone" which is built with three whole steps (6 semitones). Intervals can be consonant or dissonant. Consonant intervals are stable, pleasant and agreeable. Dissonant intervals are tense and have to be resolved to consonant intervals. Consonant intervals can be divided into two groups : perfect and imperfect. Dissonant intervals can be divided into two categories: sharp and soft. These intervals are described as stable. These intervals give the color and the quality to chords. These intervals bring tension and instability. Memorize the names of the intervals. Recognize, sing and play through a recording or a dictation. Recognize, sing and play an interval starting from any note. Work three forms of intervals : Melodic ascending, melodic descending and harmonic.